There is less than 2 weeks left until the release of The Legend of Shangri-La: Cluster Pays, the brand new pokie from NetEnt. The famed developer has had their hands full this year with many great new titles revealed. Shangri-La marks the second pokie they have released in this month alone and it will make up a trilogy of slots released by NetEnt in the third quarter before their final new pokies are revealed in October and November. As with many recent pokies, Shangri-La is inspired by cultures and legends from the Far East. The game features a wise bear monk as your companion who will watch you play this slot against a beautiful Zen garden background. 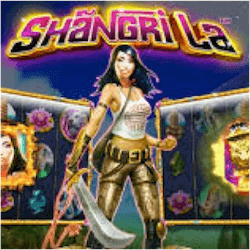 The Legend of Shangri-La is another game that features the NetEnt trademarked Cluster Pays system where the more adjacent symbols you land together, the bigger your payout will be. Another Pokie that used this unique feature this year was the Hawaiian inspired Aloha: Cluster Pays. Shangri-La: Cluster Pays boasts an impressive 96.59% RTP, one of NetEnt’s highest return ratios. Players will also find Random wild events in-game where on reel icons can be randomly changed to form a winning combination. Other bonus features that are included in this pokie include a Sticky Re-Spin feature where certain symbols will remain in place and the reels will re-spin each time matching symbols lands, building massive wins for players in the process. There are of course also free spins to be won and the fruit machine style Nudge Reel feature which will instantly turn close calls into sure things. NetEnt will be keeping their gamers very happy this year. Bloodsuckers will be released on the 12th of October, followed two weeks later on the 23rd when they release Planet of the Apes, based on the blockbuster movie franchise. Finally in November NetEnt will release their last slot for the year titled Finn and the Swirly Spin. NetEnt are planning to make these pokies all fully mobile compatible so that players can play anywhere. This feature is becoming an industry standard now. Technology is moving so fast that developers like NetEnt will need to keep staying on their toes in order to remain competitive in an ever changing market. Shangri-La : Cluster Pays is set to be another jewel in the NetEnt crown. Its eye catching graphics, entertaining animations and enthralling music will keep NetEnt pokie fans completely engrossed.